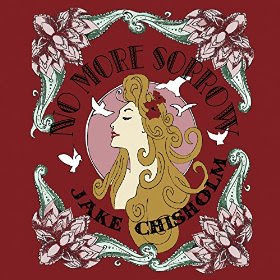 I just received the newest release, No More Sorrow, from Jake Chisholm and it's super! I reviewed Chisholm's earlier release, Diamond In A Coalmine and this is a great followup showing a nice maturation. Opening with the title track, No More Sorrow, Chisholm, backed by Sly Juhas on drums and Chris Banks on bass show just how funky and stripped down blues can be. With a super driving bass line and tight drums, Chisholm riffs off on his guitar with fluid runs and double stops showing that Dan Auerbach isn't the only north easterner who knows how to make a great 3 piece band so good it stops you in your tracks. Excellent opener! I'm On Fire, is a blues based rock and roller in the vein of Jerry Lee Lewis. With rockabilly style guitar soloing and loose echo fused vocals, Chisholm exhibits a modern twist on early rock. Very cool! Weigh You Down is a real cool progressive blues rocker with threads of Robin Trower, the Black Keys and Govt Mule but with fresh air. Paul Reddick adds a cool harmonica track on this one giving it more texture. Is There Another Man has a real cool primitive approach on blues rock with tidy guitar riffs played over rock solid bottom. Merry-Go-Round has a catchy melody but loose instrumentation giving it a good opportunity for cross air lay. I like the bass lead (Jameson Elliot)/ guitar answer interplay on this track. R&B based, Just Because You Want To, is a very strong track with an almost Gregg Allman writing style. It's warm instrumentation, solid vocals and a Hendrix run, make it a commercially strong track as well. Swamp Stomp finds Chisholm on guitar and mandolin with an almost acoustic Led Zeppelin sound. I'm Still Alone has a slinky, funky feel with chord driven riffs and a solid bass bottom. This track is a bit more adventurous with a strong guitar led, solo interlude. I Want You The Way You Are is back to the stripped down blues rock style and shows just how good this band is at minimization on a basic theme. This is a real cool track with well phrased vocals and rudimentary guitar work just hammering away. Chisholm breaks out a nicely distorted solo on this track complimenting the overall style and reinforcing its solidity. Very cool! Wrapping the release is You Never Will, a nicely executed blues track with raw edges and strong bones. This is a really super closer and one that leaves you wanting more. Nicely done!